Crown of Egypt slot is yet one more game that tells the story of ancient Egypt and all of its mystery. Granted, it is not a unique concept, but many players will understand that you can never have too many games centred on such a fascinating and intriguing time. Even to this day historians, filmmakers and game enthusiasts still manage to create stories about the ancient Egyptian civilisations that tell a different tale each time. 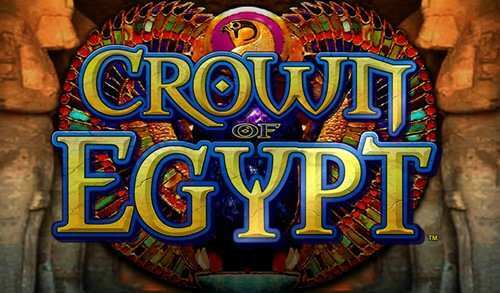 In this Crown of Egypt slot review, we will be taking a closer look at this gambling option which has an RTP of 95.03%. As the name of the gambling option suggests, the Crown of Egypt online slot offers a nostalgic combination of Magical and Egyptian themes that players enjoy. The 5-reel game was developed by IGT not only for people interested in the two particular themes but for beginners looking for a fun game with appealing visuals. Each of the Crown of Egypt video slots has 40 paylines and includes visuals of kings and queens from the ancient Egyptian era. The minimum bet that you can place while playing Crown of Egypt slot online is 1 coin, and the maximum bet is 2,400 coins. In addition to all of the bonuses and free spins the gambling option offers, IGT has stated that players have 1,024 different paths that they can take to win. It sounds like a stretch but once you start playing, you will realise that it is true. We’ve already mentioned the incredible designs and visuals that are featured in the Crown of Egypt slot machine. While these are spectacular on their own, the most appealing feature of the gameplay includes the Multiway Extra which offers doubled payouts for identical symbols that appear in the same column when you spin the reel. The logo of the gaming option acts as the Wild Symbol which can substitute every symbol but the Bonus symbol which is represented by a giant Pyramid. Getting more than two pyramids, when you spin the reels, activates a bonus round of free spins. When more than 2 pyramids appear in column 3, you get more free spins. In total, you can win as many as 20 free spins when you play. As always, IGT offers free slot Crown of Egypt for you to try your hand and the gameplay. The players interested in playing for real money can earn a maximum jackpot of $1,000. Crown of Egypt free play game is available online to be played any time you feel like doing that. If you want to gamble, play this option for real money to grab big payouts on offer. On the surface, this game is appealing mainly because of its visuals which do a good job of representing ancient Egyptian culture and figures. As you begin to play the game, the added features such as the Multiway Extra enhance its appeal and unlock an entirely different world of adventure and excitement. It’s a great game for players who like to gamble but also have a passion for history. 0 responses to "Crown of Egypt Slot"